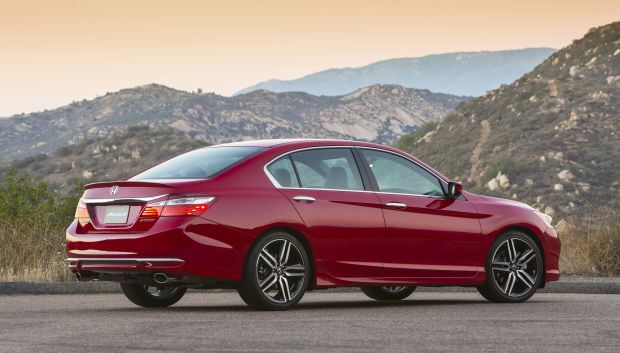 The fully redesigned Accord is the best car for you if you believe midsize sedans aren’t dead yet. Family cars, once the industry’s most popular segment, are today being outsold by compact crossovers and compact cars. With its svelte styling, better performance, additional features, and on some models, lower prices, Honda hopes the all-new 10th-generation Accord gets shoppers excited again about the midsize family sedan. Debuting as a front-wheel-drive four-door with a choice gas and hybrid powertrains, the ’18 Accord is tighter outside and roomier inside, lighter in weight and stiffer in structure. It’s styling is sleeker, it’s road manners startlingly sporty. Although it’s no longer available with a V-6, it has stronger acceleration and higher fuel economy — and you can still get it with a manual transmission. Honda isn’t the only automaker keeping the midsize-car faith. This impressive new Accord will compete with a fully redesigned version of its arch nemesis and the only rival that outsells it, the 2018 Toyota Camry. And both will be joined for model-year 2019 by an all-new Nissan Altima, the category’s No. 3 seller. Indeed, throw in the revamped 2018 Hyundai Sonata, the intriguing new Buick Regal Sportback, and the impending Ford Fusion redesign, and Americans face an unprecedented array of top-notch midsize-car choices. Still, sales are down 15 percent across the segment, crossovers are king, and there’s little evidence of the family sedan’s return to former glory. Wait if you’re uncomfortable buying a fully redesigned car in its first year on the market. Frankly, that’s of little concern when it comes to a Honda. The company has a well-established track record for putting out solid products from the get-go. We have no reason to believe the 2018 Accord will be any different. Nor will it vary in any significant way from the 2019 model. So waiting for the ’19 means you’ll almost certainly pay more for essentially the same car. Buy the 2018 to sidestep that model-year inflation and to begin enjoying this completely new car sooner. Honda isn’t reprising the two-door-coupe version of the Accord, and about the only thing this 10th-generation sedan carries over from its 2013-2017 predecessor is its trim-level structure. The model line divides along engine types: 1.5T, 2.0T, and Hybrid. Trim grades are familiar beginning with the 1.5T branch featuring base LX, performance-themed Sport, volume-selling EX, leather-upholstered EX-L and EX-L with navigation, and top-line Touring models. The 2.0T mirrors that, except for the LX. And the gasoline-electric Accord Hybrid lineup contains all but the Sport. Styling: The 2018 Accord’s clean-sheet redesign stretches the car’s wheelbase (distance between front and rear axles) a significant 2.1 inches while cutting body length 0.39 inches. That means briefer sheetmetal overhangs and, combined with a slight increase in width and a half-in reduction in overall height, creates a more athletic presence. Complementing the new proportions is a front end that looks cleaner and meaner, its grille flanked by aggressive-looking headlights that wrap into the fenders. The steeply raked windshield and tapered roof impart a coupe-like profile. The new Accord is visually and literally leaner than its predecessor, yet has more passenger and cargo space. Front-seaters have more hip, shoulder, and headroom. Rear passengers get 1.9-inches more legroom, expanding what was already an Accord strength. Back-seat headroom decreases just 0.2 inches, but the newly sloped roofline robs rear passengers of some of the sense of openness and noggin clearance they previously enjoyed. Trunk volume increases almost a cubic foot, to 16.7 cubic feet – a class-leading capacity now shared by the Hybrid, thanks to the relocation of its battery pack to beneath the rear seat. The LX has a one-piece folding rear seatback, all others a 60/40 split-folding seatback, including for the first time the Hybrid. Interior materials are notably solid and, like the precision movement of the switchgear, help impart a premium feel. Likely to require a bit of acclimation, however, is the button arrangement on the center console that controls transmission gear selection on 2.0T models; 1.5T and Hybrid Accords use a conventional console shift lever. The redesigned dashboard is upscale and efficiently laid out. Honda continues to abandon its ill-advised flirtation with touch-sensitive audio controls by giving every ’18 Accord traditional knobs for volume and tuning. It’s also joined the trend to tablet-like infotainment screens that seem affixed to the dashboard rather than integrated with it. LX models get a 7-inch display, all others an 8-incher with support for Apple CarPlay and Google Android Auto. Touring models add a head-up display, wireless smartphone charging, and in-car WiFi. Mechanical: Accord’s new body structure contributes to a reduction in weight — 110-176 pounds, depending on trim level – yet is more resistant to twisting and bending. That creates a solid new platform for the revamped suspension. Touring models introduce to the Accord adaptive dampers that can automatically adjust firmness based on road conditions. 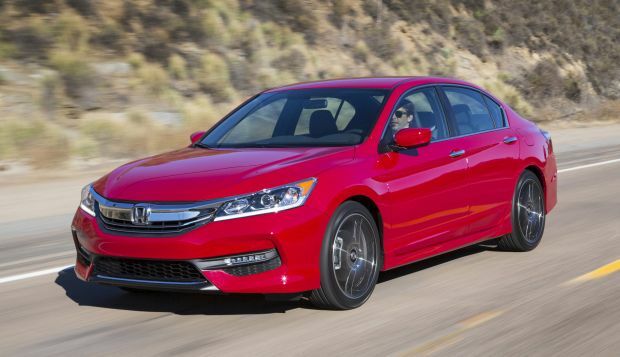 Model-year 1993-2017 Accord buyers enjoyed the option of a V-6 engine but this redesigned model joins the movement to smaller-displacement turbocharged four-cylinder engines instead. Among the dozen 2018 cars in this competitive set, only the Camry, Altima, Fusion, Subaru Legacy, and Volkswagen Passat still offer six-cylinders. Replacing a naturally aspirated 2.4-liter four-cylinder as Accord’s base engine is a 1.5-liter turbocharged four. Giving the 1.5T line its suffix, this engine is a variant of the one available in Honda’s Civic compact car and CR-V compact crossover. Here, it has a class-competitive 192 horsepower and 192 pound-feet of torque, versus the 2.4’s 185 and 181, respectively. Supplanting the previous 3.5-liter V-6 and its 278 horsepower and 252 pound-feet of torque is the 2018 Accord 2.0T line’s 2.0-liter turbocharged four with 252 horses and 272 pound feet. It borrows many of its components from the potent Civic Type R, where it makes 306 horsepower. Unchanged is the Accord Hybrid’s combination of a 2.0-liter naturally aspirated four-cylinder and electric-motor power making a net 212 horsepower (Honda doesn’t specify a torque figure for this model). This is not a plug-in hybrid and cannot travel for any significant distance on batter power alone. It relies primarily on the gas engine, with the motor assisting automatically and the battery recharging via regenerative braking and coasting. Like the previous 2.4-liter, the 1.5T is available with a six-speed manual transmission – though now in Sport trim only — or a continuously variable transmission. A CVT performs the duties of a conventional automatic but without stepped gear changes. The Hybrid again uses its own variation of a CVT-type transmission. Debuting in Accord’s 2.0T line is a 10-speed automatic transmission. It replaces the V-6’s six-speed automatic and is available with supplemental steering-wheel-mounted shift paddles for manual-type control. Enthusiasts will applaud Honda for offering 2.0T Sport models with a six-speed manual. Previously, the V-6 was available with a manual, but in the coupe body style only. The only other 2018 midsize sedan available with a manual transmission is the Mazda 6. Don’t be disheartened by the new Accord’s lack of a V-6. Models with the 2.0-liter engine are actually faster, at least with the 10-speed automatic. They may not feel that way from a dead stop, but after about half a car length, the turbo four comes alive, providing snappy acceleration. Once underway, the 10-speed automatic doesn’t respond quite as quickly to throttle inputs as it does on the V-6-equipped Honda Odyssey. Steering-wheel paddle shifters help, but they’re only included on the Sport and Touring. That being said, you’re never wanting for more power. As expected from a Honda, the 2018 Accord’s road manners are beyond reproach. Steering feel is excellent, body lean in corners is well-controlled, and the ride is a fine blend of European-style firmness and American-style comfort, even on the Sport and Touring, which have 19-inch wheels. The rest of the line uses 17s, which will trade some cornering grip for enhanced ride comfort. Features: Accord is pretty much fully up to date in terms of driver-assistance, connectivity, and convenience features. All models come standard with the Honda Sensing suite, which includes forward collision warning with autonomous emergency braking, lane-departure alert with automatic steering correction, and radar-based cruise control. New for the Accord’s version of Honda Sensing are traffic-sign recognition and drowsy-driver alert. Dual-zone automatic climate control, pushbutton ignition, and Honda’s multi-angle rearview camera are standard across the board. The 1.5Tr Sport gets specific suspension tuning and exterior/interior trim, along with CarPlay and Android Auto support. The 2.0T Sport and all EX variants, hybrid included, add a power sunroof, power driver seat, heated front seats, blind-spot alert with rear cross-traffic detection, and remote engine start. The EX-L adds leather upholstery, memory driver seat, power front-passenger seat, upgraded audio system, and a built-in garage door transmitter. Touring grades have imbedded navigation, head-up instrument display, full LED headlights, HondaLink telematics with built-in WiFi hotspot, ventilated front seats, heated outboard rear seats, front- and rear-obstacle detection, rain-sensing windshield wipers, and wireless smartphone charging. The only 2018 Accord prices released in time for this review were for the 1.5T line. Note that Honda doesn’t offer individual options, instead equipping each trim level with a specific feature set. Note as well that prices here include the automaker’s $875 destination fee. At $24,445, the 2018 Accord LX costs $315 more than the 2017 LX, but the other models are prices $535 below their previous-generation counterparts. The ’18 Accord Sport is priced at $26,655 with either the manual transmission or the CVT. The EX is priced at $28,345. Rounding out the 1.5T line, Honda prices the ’18 Accord EX-L at $30,845, the EX-L w/Navigation at $31,845, and the Touring for $34,675. Expect the ’18 Accord’s 2.0T and Hybrid models to be priced $2,000-$4,000 more than their 1.5T counterparts, depending on trim level. At what will probably be around $31,500, the Sport 2.0 is probably the best bang for your buck as it will offer good performance (abetted by availability of a manual transmission), sleek looks, and plenty of features. The only EPA ratings for the 2018 Accord released in time for this review were for the 1.5T line. They’re 26/35/30 mpg city/highway/combined with manual transmission and 30/38/33 with the CVT. Honda did release projected city and highway fuel-economy numbers for the 2.0T line, forecasting 22/32 mpg city/highway with automatic transmission for the Sport and Touring and 22/34 mpg city/highway for the other 2.0Ts. It projected 22/32 mpg city/highway for the manual-transmission 2.0T Sport. That compares with the 2017 V-6 sedan’s 22/33/25 mpg city/highway/combined with the six-speed automatic and the V-6’s coupe’s 18/28/21 with manual transmission. Expect the 2018 Accord Hybrid to improve upon its 2017 counterpart’s EPA rating of 49/47/48 mpg city/highway/combined. All 2018 Accord models use regular-grade 87-octane gasoline. October 2017 for the 1.5T line. November 2017 for 2.0T models. Early 2018 for the ’18 Accord Hybrid. Probably not a whole lot for a while. A midcycle freshening is likely for model-year 2021, at which point the Accord would receive revised exterior styling and probably some connectivity updates. While we appreciate the fact that Honda Sensing is standard across the board, it would be nice if Honda added blind-spot alert and rear cross-traffic detection to the LX and base Hybrid. Chevrolet Malibu, while generally as refined as the Accord, it doesn’t engage the driver nearly as much. Ford Fusion, which feels crude and outdated, even when compared to the last-generation Accord. Nissan Altima, which is another dated midsize sedan; its next redesign isn’t slated to hit showrooms for about another year. Mazda 6, which arguably is the most beautifully styled sedans on the road and is really the only midsize four-door in this competitive set that handles on par with the Accord; the Toyota Camry, not to be ignored for reliability and value, not to be overlooked for surprisingly adept road manners, and, with its available V-6, not to be discounted for its reassuring old-school power delivery.